Marvelously overflowing with love and touching the heart of everyone she reaches! Click on the preview above to download the PDF printable. Mothers are special and should be praised. Each and every mother is different and unique, but precious in the eyes of God. This little poster would be great to show the mothers in our churches how wonderful we think they are. Just print out and post on the doors of Sunday School classrooms or on the front door of the church. 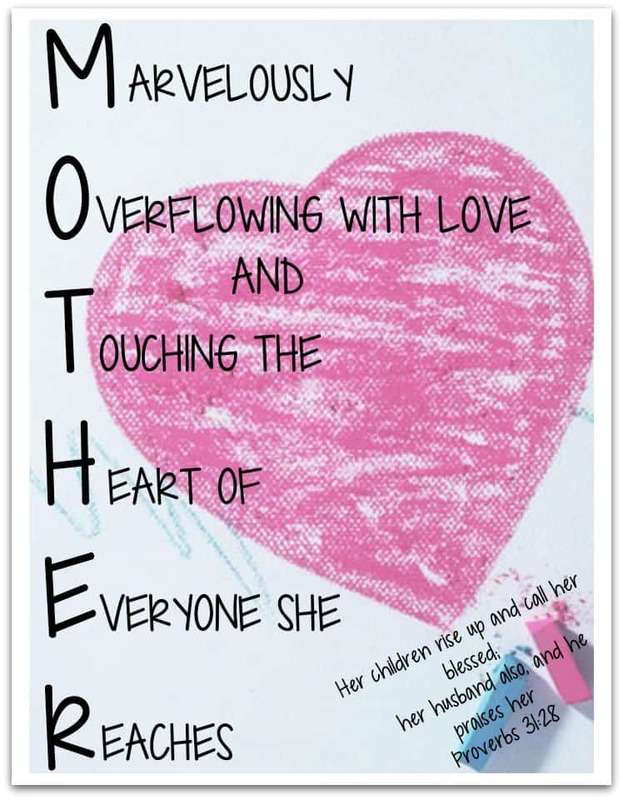 You could print out multiple copies and have each child give it to their mothers as a card. We’ve also uploaded a blank Mother acrostic printable if you want kids to create their own poem. Don’t miss the Mother’s Day Sunday School lessons and free coloring pages on our website. Tony Kummer (Editor) reviewed & updated this page on : June 23, 2017 at 10:25 pm. All our content is peer reviewed by our readers, simply leave a comment on any post suggest an update.